I’m prepared to get a bit of flak about this but I’m not big on the traditional turkey dinner. I’m not a mashed potato fan, I find plain turkey a little boring, and I’m sure you’re aware how I feel about apple pie. I even convinced my Main Taste Tester’s mom to forgo turkey dinner last Christmas day so we could eat lots of non-traditional things instead. The only thing that makes me excited about a turkey dinner is the possibility of leftovers. 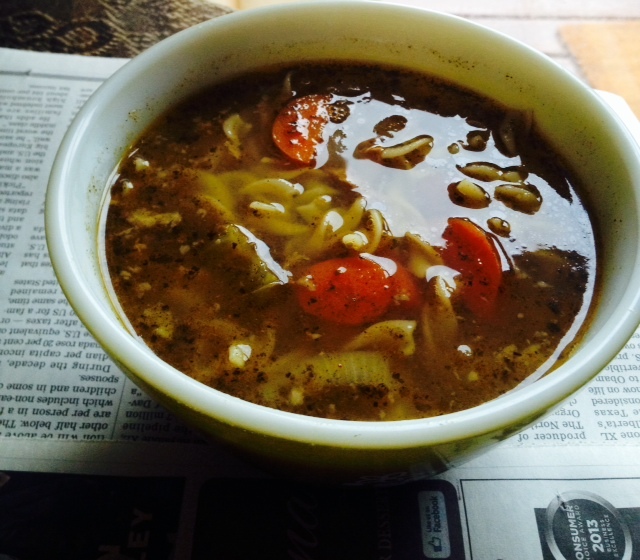 I DO get excited about turkey sandwiches, turkey salad and, most of all, homemade turkey noodle soup. This post is a little bit of a doozy (Two recipes? Who do I think I am?) but I’m only doing it because you guys need homemade soup like this in your life. First, we have the recipe for a basic turkey stock that you make on your stove top. If I have a whole day at home (which rarely happens) I will let the stock simmer all day long. If I have less time, I will start it as soon as I get home from work and pack it up before I go to bed to use another time. Additionally, I’ve included what I like to make with the homemade stock; a super delicious and comforting soup from scratch that will taste like something out of your Grandma’s kitchen. Oh, and I make it in the crock pot because we all want to come home to hot soup on a rainy (or snowy) day, don’t we? Making soup this way makes me feel a little old school and I love that. I love it so much that I don’t even feel embarrassed when begging for the turkey carcass after every special occasion dinner I attend. It’s all in the name of good soup. Combine all ingredients in a large soup pot. Bring to a boil on your stove top. Once boiling, reduce heat to low. Simmer for at least 4-8 hours (the longer you cook, the better the broth), stirring occasionally. Once you have simmered the stock for your desired amount of time, strain it into a container and discard everything left in the strainer. You can keep your stock covered in the fridge until you are ready to make soup or you can freeze it as well. Add all of the ingredients except the noodles to your crock pot. Cook on low for 8 hours. Just before you are ready to eat, turn crock pot to warm. Cook your noodles according to package directions. This is when I taste the soup and add more salt or pepper if it needs some. To serve, ladle soup in bowls and top with cooked noodles and saltine crackers if desired. I also make this soup with chicken bones/carcasses as they are easier to come by than a turkey most of the time. Making stock like this is a great way to use vegetables that are on their way out and to tweak the flavor of the classic broth. I have thrown just about everything in at some point or another. I usually make the stock one day (or evening) and then make the soup in the crock pot a day or two later. The night before we want soup, I get everything ready in the crock pot so all I have to do is take it out of the fridge and set it to low in the morning. Makes for a nice supper to come home to after work! This recipe is for a 4.5 quart crock pot. Adjust quantities accordingly if your crock pot is smaller or larger. Keeping the noodles separate prevents them from getting soggy, particularly with leftovers. Without the noodles, this soup also freezes well. Regarding salt and pepper, everyone has different preferences so play around with the amounts until you find what you like. I usually add a little more onion salt and garlic salt because I love the flavor it gives. My MTT also adds a little dash of cayenne to his bowl because he likes it spicy. Make it your own! Another one to change up your lunch!